The Government has decided to drop the amendments to the Dowry Prohibition Act, 1961 after taking into account the comments of the high level committee on the status of women and the ministry of home affairs. The amendments, as proposed by the National Commission for Women, included broadening the definition of the word ‘dowry’, by changing the words ‘in connection with marriage’ to ‘given before the marriage, at the time of marriage and at any time after the marriage’ as well as providing a penalty for misuse of the Act. Separate penalties for giving and taking of dowry and penalties for non-maintenance of lists of gifts received at the time of marriage were also recommended. In addition to this, a new clause was suggested to be inserted which would’ve provided an aggrieved woman the opportunity to file her case either at the place where the offence was committed or where she permanently or temporarily resides, they said. Mandatory requirement for couples to notify the list of gifts exchanged during the wedding ceremony. The list of gifts, in the form of a sworn affidavit, has to be notarized, signed by a protection officer or a dowry prohibition officer and kept by both parties. Failure to keep the list of gifts could invite heavy penalties including a three-year jail term not only for the bride and groom but also their parents. 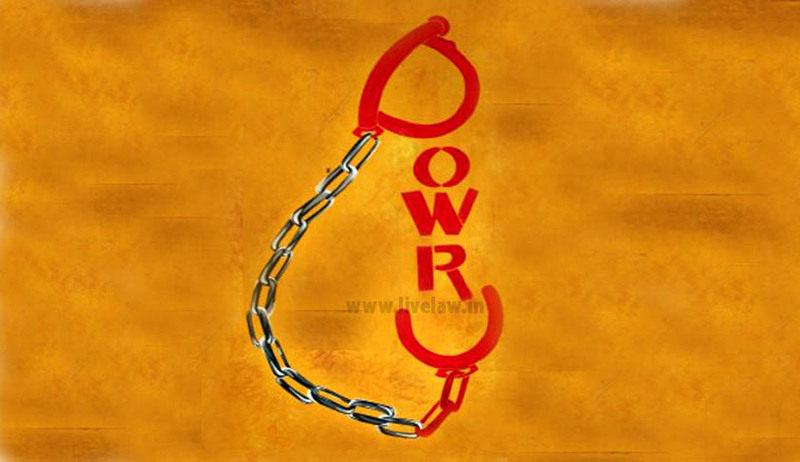 The penalty for dowry-givers reduced from five years’ imprisonment to one year. The Domestic Violence Act linked to the Dowry Prohibition Act, for quick relief. In case of a woman’s death, all property obtained as dowry goes back to the parents of the woman or her children. Earlier in March, the Supreme Court had come down heavily on High Court and trial Court’s reason for convicting an accused for the offences U/S 306 and 498A IPC. Read the Live Law story here. Subsequently in July, a Supreme court Bench comprising of Justice C.K. Prasad and Justice P.C. Ghose had issued strict guidelines for preventing automatic arrest in cases involving section 498-A. It had gone to the extent of stating that non-compliance of the guidelines will attract disciplinary and contempt proceedings. Pondering over the disturbing statistics, the Court had noted, “Crime in India 2012 Statistics” published by National Crime Records Bureau, Ministry of Home Affairs shows arrest of 1,97,762 persons all over India during the year 2012 for offence under Section 498-A of the IPC, 9.4% more than the year 2011. Nearly a quarter of those arrested under this provision in 2012 were women i.e. 47,951 which depicts that mothers and sisters of the husbands were liberally included in their arrest net. Its share is 6% out of the total persons arrested under the crimes committed under Indian Penal Code. It accounts for 4.5% of total crimes committed under different sections of penal code, more than any other crimes except theft and hurt. The rate of charge-sheeting in cases under Section 498A, IPC is as high as 93.6%, while the conviction rate is only 15%, which is lowest across all heads. As many as 3,72,706 cases are pending trial of which on current estimate, nearly 3,17,000 are likely to result in acquittal”. The Court, in strong words, had expressed its dissatisfaction as to how the power of arrest and detention is dealt with equally by Police and Magistrates. Read the LiveLaw story here. Another Writ Petition had been filed in August, seeking a declaration that Section 498A of IPC is non-existent, redundant and non-operational in law and hence, proceedings, prosecution and conviction under the said section is unconstitutional, ultra vires, arbitrary, void and illegal after the Repealing and Amending Act, 1988. Read the Live Law story here.